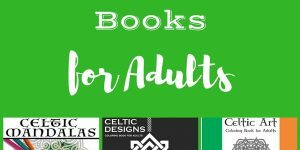 Trying to think of a fun and creative gift idea to give someone for St. Patrick’s Day? 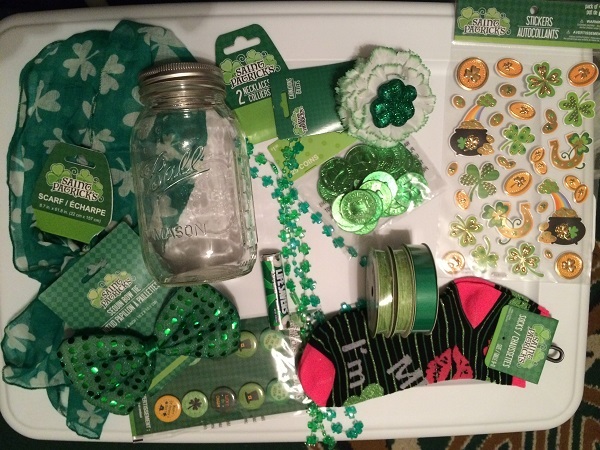 Why not make up a decorative mason jar full of green and St. Patrick’s Day related goodies? This is a great idea for anyone, man, woman, or child, and the general mason jar gift idea can be used for any holiday and any special occasion. 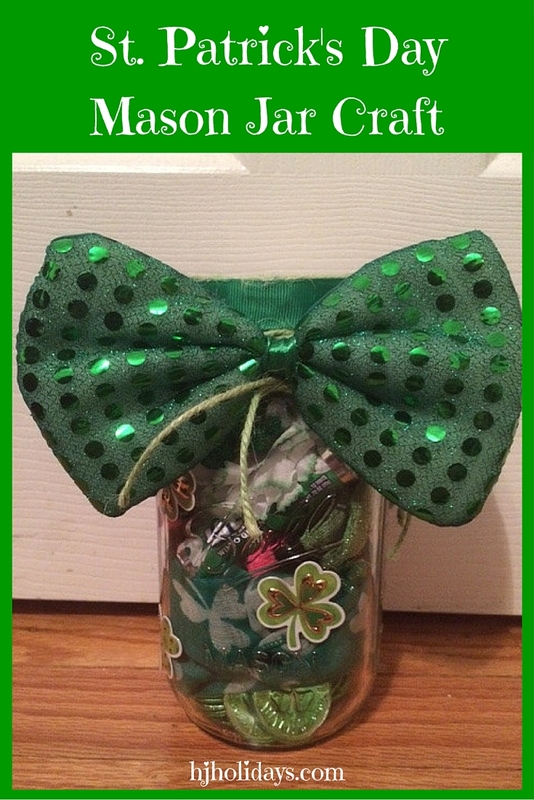 For this project, I chose to make up a jar for a tween/teen girl, putting in lots of cool things that she can wear and use to spice up St. Patrick’s Day. 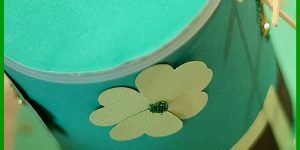 Here is a tutorial with pictures to help inspire your own ideas for creating a delightful St. Patrick’s Day mason jar craft gift. Remove the canning lid and ring from the mason jar. In the center of the lid, place a dab of hot glue. Then, place the jute in the center and begin wrapping it around itself in a circle. 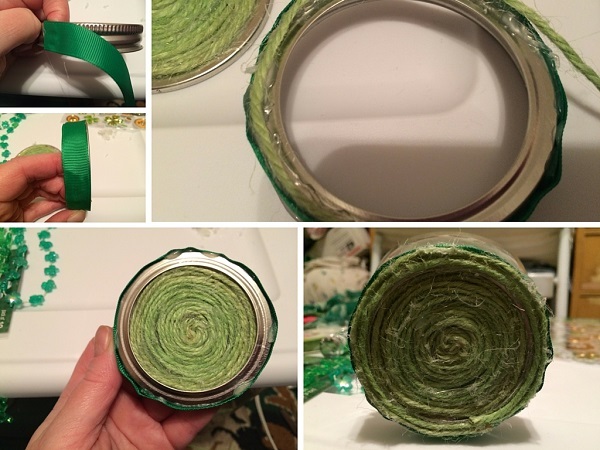 Place only a small amount of glue at a time and gradually continue wrapping the jute bit by bit until you reach the raised section of the jar lid. At this point, cut the jute and glue the end in place. Don’t wrap the entire section or else the canning ring will not fit around the lid. Set the lid aside for now and move on to the canning ring. Note that materials such as felt or fabric could be used instead of the jute for this step, I used the jute to add texture and a contrasting shade of green. Note: When gluing the jute, the hot glue will dry on the canning lid almost immediately, so only use a bit of hot glue at a time so that you can quickly place the jute before it dries. Take the canning ring and place a dab of hot glue on the side. Make sure to cover small sections of the ring surface at a time and carefully place the green ribbon along the edges. Continue placing and gluing the ribbon all the way around the ring. Cut the end and glue into place. Now, you will notice that some of the gold color is still showing at the top of the canning ring. This is an area that is just wide enough to wrap two rounds of the light green jute around. Glue the jute into place and glue bit by bit until all gold area is covered. 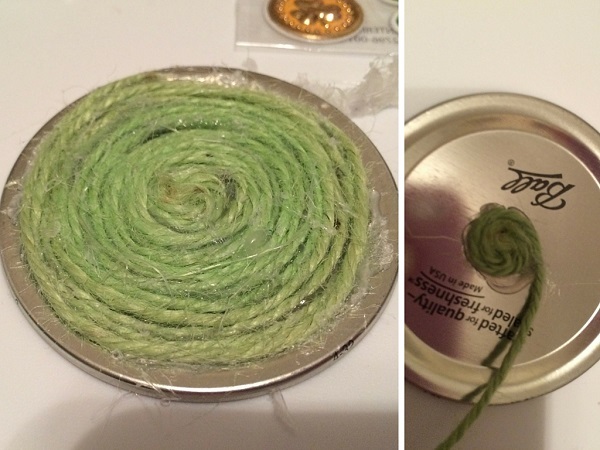 When you place the canning ring and lid together now, it should look as if the jute is just one continuous circle that covers the entire top of the jar. To start the filling process, I emptied the bag of green plastic coins into the bottom. They serve no real purpose other than that they are shiny and make a great decorative addition to the jar. 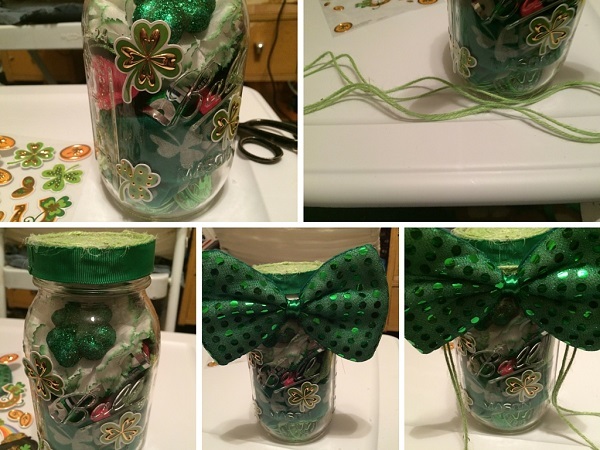 I then layered the jar with items as I went along, next placing the green Shamrock scarf in. I then added the two Shamrock necklaces, then the cute socks. Next came the green Life Savers roll, then the carnation/Shamrock hair clip. The last thing I put in the jar was one section of the buttons that I simply cut in half from the cardboard they were packaged in. Then I rolled them up to fit at the top of the mason jar. Keep in mind, this jar theme is for a young tween/teen girl and has items that would appeal to her. 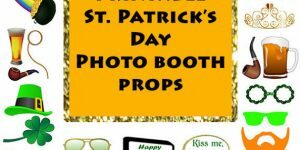 Feel free to personalize the jar with whatever green and St. Patrick’s Day related items relate to the person for whom you are making the jar gift. Note: Make sure to remove all cardboard and packaging materials from the items before filling the jar, as they take up valuable space. This is a fun and simple craft where you can really use your imagination. Think of using a mason jar gift to present to someone as a baby shower gift, Easter gift, Birthday or Christmas present, etc. Mason jars can also be filled with edible ingredients with an included recipe, etc. The ideas on different ways to use this type of jar gift are endless.